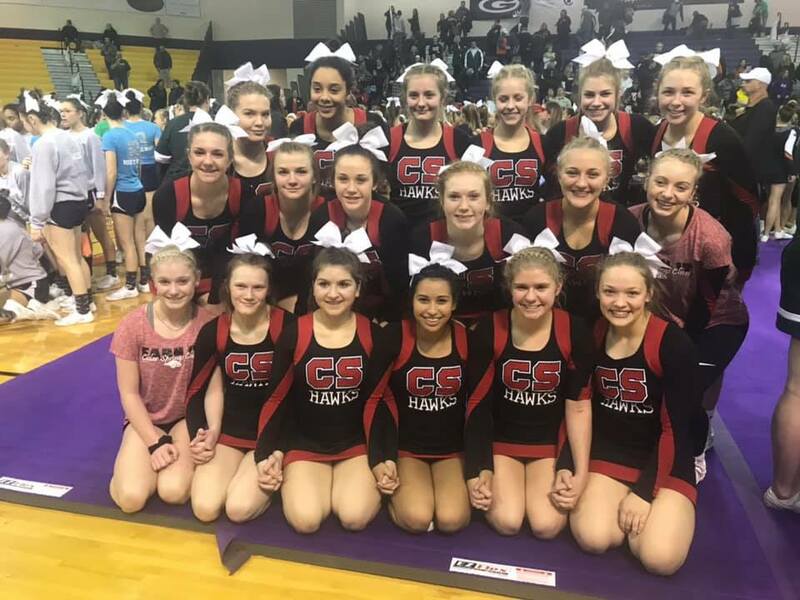 The Cedar Springs Varsity Cheer finished in first place at their home competition and were beaten out of the top spot in Division 2 by only one point at Caledonia last week. Last week was another successful week for the Cedar Springs High School Competitive Cheer team. The girls hosted their only home OK-White Conference competition of the season on January 23. The Varsity Lady Red Hawks crushed their competition, outscoring the second-place team by over ninety points! The JV team also took first at the event, by earning a combined round three score of 567.44, despite facing many challenges. This competition was also Senior Night, in which five young ladies were honored for the hard work and dedication they have given to the program throughout their high school careers: Gabby Endres, daughter of Greg Endres and Melissa Monroe; Melody Hughes, daughter of Doug and Ann Hughes; Elayna Male, daughter of Dan and Heather Male; Emily Pierson, daughter of Bill and April Pierson; and Nicole Skogster, who is the Finnish exchange student of Dave and Terri Castor. We wish each of these remarkable young women all the best as they begin a new chapter of their lives. On Saturday, January 27th, the Varsity squad traveled to Caledonia to compete in the LMCCOA Scholarship Invitational. Many of the best teams in West Michigan were present at this event and each team (thirty-eight overall) came prepared to win. The Lady Red Hawks earned their highest round one scores (234.1) and round three scores (316.4) of the season and fell short of winning the Division 2 bracket by only one point, with an all season high score of 774.82. Scholarships were presented at the conclusion of the competition and Lady Red Hawk Emily Pierson was named as one of the LMCCOA Scholarship recipients and received a $1,000 scholarship. Congratulations Emily! On Saturday, February 2, the team will compete in the Kenowa Hills Cheer Invitational. We wish these ladies the best of luck as they enter the second half of their season…#EARNIT!